Traditional holiday home close to the Friuli Dolomites Nature Reserve. 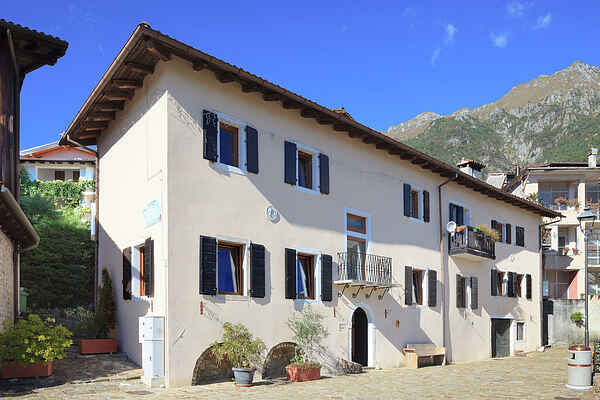 This attractive holiday property is located in the charming and picturesque old town of Poffabro. The building steeped in history and displays the regions typical architecture, with a total of 3 delightful holiday apartments. The apartments are furnished in a welcoming style and offer pleasant views over the town square. Guests will even be able to make out the sound of the local church bells. Nearby services include shops, restaurants etc. The village, with its shops and characteristic streets is so attractive that it has been voted one of Italys 30 most beautiful villages. Tourists will also enjoy the areas food and wine. Not simply a great mountain location, this house also makes a fantastic base for spending a few days at the seaside: the beaches of Lignano Sabbiadoro can be reached in just over one hour by car.